Japan's GDP fell 4 percent last quarter, the fastest pace on record. TOKYO, Japan (CNN) -- Japan's GDP fell 4 percent last quarter, the fastest pace on record, the government said on Wednesday. 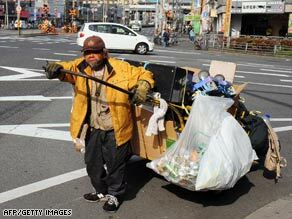 A homeless man pulls his cart filled with possessions and goods for recycling on March 18 in Osaka, Japan. The January-March quarter for Japan was 15.4 percent lower than the same time period last year, according to figures released by the Cabinet Office. Exports fell 26 percent on quarter, while imports were down 15 percent. The GDP slide in the world's second-largest economy is the greatest drop among the world's leading economies. By comparison, GDP in the United States fell 6.1 percent on an annual basis. This was the fourth straight quarter the Japanese economy contracted. Analysts say the drop reflects cuts in domestic spending with job cuts, factory closings and less capital spending as a result of spiraling sales abroad. The news punctuates a month of poor economic news out of Japan in recent weeks. Panasonic, one of the world's largest makers of electronic devices, announced it lost nearly $4 billion in the fiscal year ending March 31. Hitachi lost $8 billion in the fiscal year, with consolidated revenues down 11 percent from last year, the largest loss ever recorded by a Japanese manufacturer. NEC Corporation lost $3 billion in the past fiscal year, down nearly 11.5 percent from last year. Meanwhile, Nissan lost $2.3 billion for the year.Sony Corp. announced net losses of $1 billion for the fiscal year ending March 31, finishing a year in the red for the first time in 14 years.